World Heroes Perfect © 1995 SNK. A new button layout for the final game in the series greets the 16 fighters, 1 hidden fighter and 2 end bosses. World Heroes Perfect was released in May 1995. The game was feveloped by ADK. ADK's name is 'Alpha Denshi Kikaku'. Son Gokuu is based on the famous mythological character known as Sun Wukong from "Journey to the West". Since World Heroes Perfect, ADK games has gone out of business and all intellectual properties and copyrights to the games and characters have passed to SNK Playmore. Hanzo, Fuuma, Mudman and Neo-Dio would then appear in the fighting game "NeoGeo Battle Coliseum" (along with Kisarah from Aggressors of Dark Kombat, also by ADK) as a result. [JP] July 21, 1995 - World Heroes Perfect [PCCB-00185] - Pony Canyon / Scitron. [JP] August 19, 1995 - World Heroes Perfect Arrange Sound Trax [PCCB-00188] - Pony Canyon / Scitron. 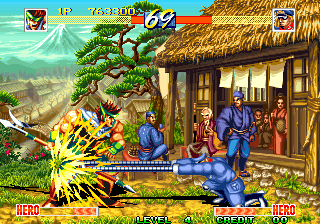 In the Japanese version of the game, there is Japanese text underneath each players life bar during a fight displaying the player's taunts, yells and screams during a fight in text form. Combo information is also shown there when you do a combo. This feature is removed from non-Japanese versions of the game. This also occurred in World Heroes 2 Jet. * Alternate Costume Colors : Press D button when selecting a character. * Play Against Son Gokuu : Get 3 special stage finishes on the each round. If you're done correctly, you will fight Son Gokuu. * Play as Son Gokuu : At the character selection screen, Hold C and press Up (x2), Down (x2), Left (x2), Right (x2), then press BC at the same time. If you're done correctly, Son Gokuu will appear left side of Jack the Ripper. 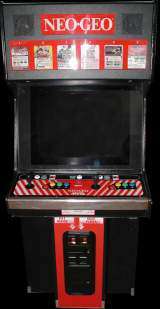 * Play as Neo-Dio : At the character selection screen, Hold B and press Up (x2), Down (x2), Left (x2), Right (x2), then press BC at the same time. If you're done correctly, Neo-Dio will appear right side of Ryofu.